Solar shingles combine the benefit of solar-generated electricity with the reliability of traditional roof shingles. If your customer is considering a solar photovoltaic (PV) system but isn't crazy about the look of conventional solar panels, solar shingles might be the right fit for them. Solar shingles can be used as the primary roofing material, or they can replace conventional shingles in specific areas of the roof. While flexible, or thin-film, solar roofing of the past had to be installed over a separate roofing material, today's solar shingles are rigid materials that serve as shingles themselves. In other words, you install them in place of other roofing, not on top of other roofing. This means that a roof could be covered almost entirely with solar shingles, although this would be quite expensive. It is most cost-effective to install solar shingles when replacing an old or damaged roof or during new house construction. This is because tearing off good shingles to install solar shingles means you lose the remaining value of the original shingles. As of August 2018, Tesla, the leading manufacturer of rigid solar shingles estimates the cost of solar shingles at about $22 per square foot, installed. At this price, the total cost of a new roof of solar shingles is about 33 percent higher than a comparable roof with conventional shingles and standard solar panels. Additionally, the roof of solar shingles may produce about 30 percent less electricity than its conventional counterpart. The primary benefit of solar shingles, aside from the electricity generation, is their appearance. When viewed from the street, a roof of solar shingles can look very similar to a standard shingled roof. Solar shingles also come in several different styles that can mimic clay tile and slate as well as conventional asphalt shingles. A much lesser-known benefit of solar shingles is that they are extremely tough because they are protected by a layer of quartz glass. This makes solar shingles one of the toughest roofing materials available. 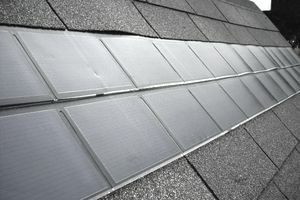 Solar shingles can be used for both grid-tied and off-grid PV systems. Grid-tied systems are connected to the local utility's power grid and can deliver excess electricity onto the grid. In some areas, homeowners can receive credits or payments for this excess power. Grid-tied systems rely on the grid for operation, so they don't work when there's a power outage. Off-grid systems do not connect to the power grid and use the solar-generated electricity to charge a large bank of batteries. The home (or other building) draws all of its power from the batteries. Grid-tied systems are most common in rural or remote areas where grid connection is difficult or unavailable. With both types of PV system, the solar shingles generate direct current (DC) power, which is then converted to alternating current (AC) power via a power inverter for use in the home. The overall size of the PV system—and therefore how much area of the roof is covered with solar shingles—is typically based on the household's annual electricity usage and how much the homeowners want to offset their utility-provided power with solar power.